The following is a translation into English of an article which appeared in the Culturas supplement of the Spanish newspaper La Vanguardia on 20 October 2018. It’s 26 January 1972. An american author sits down to write a letter. He’s famous, very famous. At the end of the 1950s a novel of his came out which went on to be published practically all over the world. It’s a short but very influential book: a whole generation of young people identify with its protagonist, who is, at the same time, a version of the author himself. But fame doesn’t sit well with this man. In the years since his book came out he has disappeared from public view. He doesn’t bring out any more books, doesn’t give interviews, and if one of his millions of fans happens to find him in his hideaway, in the eastern US, they are likely to be received with a barrage of insults. The author is interested in mysticism; his first marriage was conducted as a Hindu ceremony, later he studied under a Zen master. But perhaps he is yet to find what he is looking for. So, in the early 70s, he turns in a different direction. The man is J.D. Salinger, author of Catcher in the Rye. The person he is writing to is the Anglo-Afghan writer Idries Shah. If Salinger was one of the most enigmatic literary figures of the 20th century, Shah was equally so. 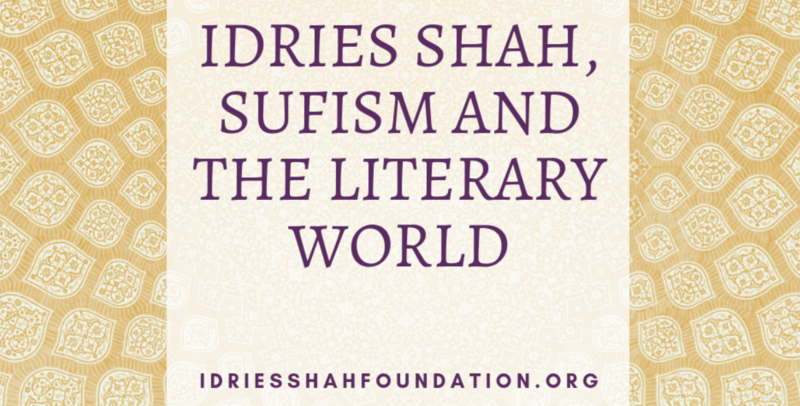 From 1964, the year of the publication of his masterpiece The Sufis until his death in 1996, Shah became the Western authority on the mystical stream associated with Islam, writing some 40 books and regularly appearing in the press in both the US and Britain, where he lived. He was a friend and counsellor to kings, ministers, artists and writers, but also to housewives, businessmen and people of all kinds who found in his work something important and profound, and a means to develop the skills to start finding answers to big questions for themselves. Yet in Shah’s case – as opposed to Salinger’s – his public image has diminished over the past 20 years, and if he hasn’t disappeared completely from view, he has become less visible… until now. Today many are rediscovering – or discovering for the first time – Shah’s work thanks in large part to the the efforts of his family and descendants to put new energy into the publication of his books, adapting them to modern platforms to make them available as as ebooks, audiobooks, online, etc. as well as bringing out new print editions, which have been appearing in Spain in collaboration with La Llave publishing house since 2017. This new impulse coincides with the opening for the first time of Shah’s personal archives. Amongst the enormous amount of material they contain are thousands of letters which he used to receive from many corners of the world over the course of his life. And several well-known people figure among Shah’s correspondents. It is known that Salinger was interested in mysticism – for example, Zen – but until now no one was aware that Sufism and Shah’s books also influenced him. The letter he wrote Shah from Vermont in 1972 shows that not only did he want to study Sufism under Shah, but that he also thought Sufism would help him start writing again. Why did Salinger think that what Shah was offering might help him? What is Sufism, which Shah did so much to reintroduce to the West in the second half of the 20th century? The usual definition of Sufism is that it constitutes the mystical tradition within Islam. But Shah insisted that despite the many historical links between the two movements, Sufism predated Muhammad’s mission and in truth existed outside of time. The Sufis were, and are, guardians of a universal truth related to the destiny of humans on Earth, whose outward appearance can change according to the needs of each era, place, and of the people involved, while always remaining faithful to an original and eternal source. Before, Sufism was a reality without a name. Now it is a name without a reality. Explaining the subtleties of another reality with the limited definitions of this reality is, according to Sufis, something almost – but not entirely – impossible. Shah was born in 1924 in India, the son of well-known Afghan diplomat and aristocrat Ikbal Ali Shah, and a member a family belonging to the Sayyids – descendants of the Prophet – with long associations with Sufism. After writing a travel book about his journey to Mecca, and another two on magic, Shah began to make a name for himself when his book The Sufis came out, first in the US and then in Britain, in 1964. With this comprehensive and concentrated study of the Sufic tradition he started to attract a large number of people interested in his work. But if they expected to find a typical ‘guru’ of the times, with exotic clothes and mannerisms, they were disappointed: Shah tended to describe such people as ‘spiritual tourists’ and insisted on the need to live a balanced and ‘normal’ life in the way understood by the society to which one belonged. Those who understood this basic concept were more capable of approaching an understanding of what Shah was trying to communicate. ‘I have been reading and reading – everything that I can find, Buddhism, Yoga, Subud, and so on, and finally got myself into such a state of indigestion that I swore I’d not open another book on the subject till I could get advice, but luckily I didn’t keep this resolution, because otherwise I would not have read your book, for what you say in it seems to be what all the other books have led towards. ‘I don’t usually write reviews because the books the send me to review bore me. But if I could persuade someone (for example at The New Statesman) to let me write something on the kind of book they would never associate with me, it might serve as a little bridge between your world and a very different one. With time, Lessing would do much to spread word of Shah’s work, writing many reviews of his books, along with articles and, ultimately, his obituary when Shah died in 1996. Lessing herself died in 2013. Recently, a British writer, Nick Holdstock, tasked with organising Lessing’s personal library, described how amongst the thousands of titles (over 4,000 in total) the only ones she read and re-read, leaving many comments and notes scribbled in the margins, were Shah’s books. There’s no doubt – and the letters confirm this – that Shah’s Sufi teaching was the greatest influence on Lessing’s life, both personally and professionally. Despite their friendship, which developed over decades, the relationship between Lessing and Shah never lost the tone of that of master and student. This wasn’t the case, however, between Shah and another giant of 20th-century English letters, Robert Graves. Graves had returned to live in Mallorca after the Second World War when he met Shah in 1961. At that point Graves was a celebrated poet and novelist and the author of The White Goddess, an essential book for understanding the relationship between poetry and mysticism. The 59-year-old Graves felt a strong connection to Shah, then in his 30s, and he helped him in every way he could to write The Sufis. He even wrote an introduction for it, a major boost for Shah which not only helped get the book published, but meant that a generation unaware of Sufism but interested in unorthodox thinking got to read it. Salinger, Lessing, Graves… three literary giants, each one influenced in some way by, or with a strong connection to, Idries Shah. But there were others. A year after Graves died in Mallorca, Jorge Luis Borges, another admirer of Shah, passed away. Borges had Shah’s books in his library; as someone who studied Eastern mysticism, he wrote stories similar to those compiled by Shah in his ‘teaching stories’ from the Sufic tradition. Other well known figures also read Shah, including Ted Hughes, the psychologist Edward de Bono, and Claudio Naranjo. And yet, despite producing a large amount of material and becoming one of the most prominent people of his age, Shah never sought the limelight, preferring to work ‘in the shadows’. And it is perhaps this figure which can be revealed today thanks to the opening up for the first time of his personal archive. It appears that Shah’s idea was to have a profound but uncelebrated influence on a world he perceived as in need of the teachings which the Sufic tradition could provide. A large part of his work consisted of translating the wisdom of the ancients into the language of psychology, a relatively young discipline in the West, yet one capable of articulating certain subtle and new concepts in a style which was comprehensible and acceptable for a principally American and European readership. One example will suffice of the almost invisible impact Shah has had on our thinking: in the 60s few people spoke about the importance of maintaining healthy levels of attention for the proper functioning of an individual. Now, 50 years later, it seems people talk of nothing else. And it was Shah who instigated this change. According to the Sufis, attention is key for understanding a large proportion of human behaviour, our attitudes, thoughts and beliefs: a lack of attention can explain why, for example, we act in strange and unexpected ways. In a world which is ever more dangerous, learning and understanding this lesson has an urgency about it. Shah had a huge yet largely unrecognised influence on a whole generation of writers, thinkers and people of all classes, and this is now becoming more widely known. Could a new generation find inspiration and teaching in his writings today? Esta entrada se ha publicado en Artículo, Idries Shah, Lecturas, Vale la pena ver y se ha etiquetado como Idries Shah, Lecturas, mundo literario, sufismo. Marca el vínculo permanente.